This delicious recipe proves that vegans can have their cake and eat it too! 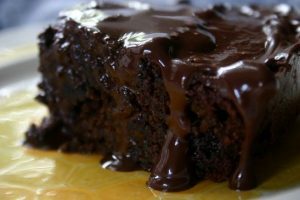 It’s an easy, fun and tasty way to enjoy vegan chocolate cake, cruelty free. Perfect for any kind of occasion, expect to really wow your guests…they’ll never guess it’s vegan! Vegan Chocolate Cake: they’ll never guess it’s vegan! Sift together the flour, cocoa, baking soda, and salt. Place these dry ingredients in a large mixing bowl. Add the apple cider vinegar to the milk and beat until frothy. Whisk in the vanilla, sugar and oil. Add about a third of the wet ingredients to the dry ingredients and mix them together. Add another third, keep mixing and then add the final third. When ingredients are all in, stop mixing. Pour the cake batter into two round, 8 or 9-inch cake pans that have been greased with coconut oil or vegan butter. Bake for 25 minutes (or until a toothpick inserted into the center of the cake is clean). Allow the cakes to cook completely. If you desire a frosted cake, frost with a non-dairy frosting!